Platform safe harbors have been in the crosshairs of copyright industry lobbyists throughout 2017. All year EFF has observed them advancing their plans around the world to weaken or eliminate the legal protections that have enabled the operation of platforms as diverse as YouTube, the Internet Archive, Reddit, Medium, and many thousands more. Copyright safe harbor rules empower these platforms by ensuring that they are free to host user-uploaded content, without manually vetting it (or, worse, automatically filtering it) for possible copyright infringements. Without that legal protection, it would be impossible for such platforms to operate as they do today. In May this year we heard recording industry representatives call copyright safe harbor a greater threat to their industry than piracy. But that alarming claim isn't based in reality. In most countries that have copyright safe harbors, a platform comes under a responsibility to remove copyright-infringing content of a user once they are notified of it according to law. In the United States, that law is section 512 of the Digital Millennium Copyright Act (DMCA), and in Europe it is Article 14 of the E-Commerce Directive. But Big Content isn't satisfied with such laws, because they place responsibility on copyright holders to request the removal of infringing content, and because the availability of free, user-uploaded content supposedly depresses the value of mainstream, paid entertainment. The content industry thinks a filtered, regulated Internet that suppresses user-uploaded content will deliver them higher revenues, and they describe the absence of these imaginary monopoly rents as a "value gap." Content industry lobbyists' worldwide efforts to eliminate or weaken copyright safe harbors have been most focused in Europe, where they have the ear of the European Commission, the body that introduces the first drafts of new European laws. Last year, the Commission produced a draft Directive on Copyright in the Digital Single Market that sought to reinterpret the E-Commerce Directive in such a way as to distinguish between Internet intermediaries such as cloud services and ISPs, which would remain entitled to the copyright safe harbor, and platforms that store and optimize the presentation of large volumes of user-uploaded content, which would not. Supporting this purported reinterpretation of the law would be a new requirement on user-content platforms to implement automated upload filtering of allegedly copyright-infringing content. Throughout this year, various committees of the European Parliament have had the opportunity to review and propose amendments to the Commission's proposal, which EFF and European groups have joined in criticizing as illegal and disproportionate. In the United States, copyright holder efforts to weaken copyright safe harbor protection have been proceeding on several fronts. The first is the Copyright Office's ongoing study on section 512 of the DMCA, in which many copyright holder representatives argued in favor of replacing the DMCA's "notice and takedown" system with an automatic filtering mandate. As we have explained, this would be nearly identical to the extreme censorship measure proposed by the European Commission. 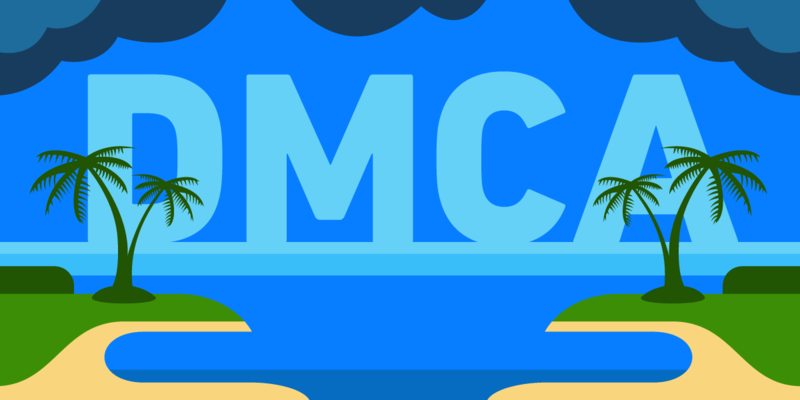 The DMCA safe harbor was also weakened by the adoption late last year of a new rule requiring websites to renew their DMCA agent registration on a triennial basis. If they omit to do this, the website would lose its protection from copyright claims for user-uploaded content under the DMCA safe harbor. This unnecessary new requirement will hit the smallest online platforms the hardest, as it is they who are least likely to have the capacity to keep up with Copyright Office red tape, until they unexpectedly find themselves on the receiving end of a lawsuit. A third front on which copyright holder groups are attacking copyright safe harbors is through the negotiations for a modernized North American Free Trade Agreement (NAFTA). In submissions to the United States Trade Representative (USTR), big content lobby groups such as the Recording Industry Association of America (RIAA) have slammed the DMCA 512 safe harbor as "antiquated", and advocated for its overhaul in NAFTA with new rules that would encourage mandatory filtering and blocking. Australia is an unusual case, in that although it passed copyright safe harbor laws in compliance with its 2005 Free Trade Agreement with the United States, due to what is widely acknowledged as having been a drafting error, the safe harbors only protected commercial ISPs, while excluding a number of other Internet intermediaries including websites and universities. You would think that it would be a no-brainer to fix such a simple drafting error, but that's without reckoning on the power of content industry lobbyists, who responded to an inquiry on the safe harbor provision earlier this year by urging the government not to close this loophole. Sure enough, a dozen years after the original Australia-U.S. Free Trade Agreement, the government has now announced that for web platforms, the safe harbor drafting error will not be corrected for now, thereby leaving platforms exposed to claims from copyright owners over user-uploaded content. Despite what big content lobbyists may say, this is no time to rethink copyright safe harbors. They are as vital to the Internet today as they have ever been. Weaker copyright safe harbors would mean fewer platforms willing to take the risk of hosting unmoderated speech of users. And with fewer platforms willing to host users' speech, the result would be a very different Internet from the one we know—one in which it would be much harder for users to exercise their freedom of expression online. So far from re-examining copyright safe harbors in 2018, we will be redoubling our efforts to defend them, as the European Union finally votes on its Digital Single Market Directive, North America negotiates the shape of the safe harbor rules in NAFTA, and users in Australia and other countries engage in their own battles to preserve freedom of expression online.